Community or shared solar programs allow multiple utility customers to connect to one shared solar installation, benefiting from the power provided and financial savings. Customers who otherwise wouldn’t be able to install solar panels on their homes — either because they’re renters, they can’t afford panels on their own or due to structural or shading issues — are able to access clean solar energy through these programs. According to an assessment by GTM Research, between 50 and 75 percent of residential rooftops are unsuitable for solar systems. Community-based solar energy systems are a promising way to give those customers access to renewable energy (GTM Research 2018). Community solar projects can share similarities with utility-scale solar projects (e.g. large capacity size and frequently ground-mounted systems). However, they are generally considered distributed solar due to the direct benefits they provide communities and their proximity to where electricity is used. States can encourage community solar installations through a variety of policies, including virtual net metering and specific community solar legislation. Virtual net metering is a type of aggregate net metering, where credits from one solar system are used to offset multiple customers’ electricity bills. 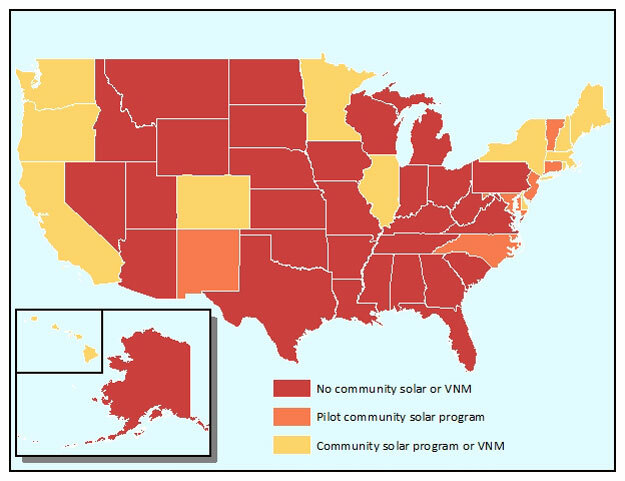 Eighteen states and Washington, D.C. currently have community solar or virtual net-metering policies in place, but some of these policies are limited to pilot projects or only certain utilities. The growth of distributed solar in the United States has so far been built on customer-owned and third-party-owned solar energy system models. Utilities and local governments have generally not taken a central role in distributed solar deployment, but often have inherent involvement through owning and operating the overall electricity system through which these solar systems are connected. Through certain community solar business models, municipalities and utilities tend to play a more central role. Two common examples of community solar models are community-shared solar and community choice aggregation (CCA). Shared solar projects are those that allow individual or group participants to buy or lease a portion of a large distributed solar system that is generally not on their property. Participants use the energy created by that system against the demand on their electricity bill, as if their share of the system were on their rooftop (GTM Research 2018). Participants in shared solar projects usually lease the solar equipment or purchase the electricity produced by the system, often located remotely. There are a wide variety of program structures and business agreements, which impact how the participants and utilities derive benefits from the program. These programs and their effectiveness vary by state and local utility. Publicly-owned utilities have in general taken the lead in developing shared solar projects, but projects can also be hosted by a third party organization, non-profit or investor-owned utility. Financing comes out the customers’ pockets, through utility or ratepayer subscriptions, or from grants or donations (SEIA 2019). 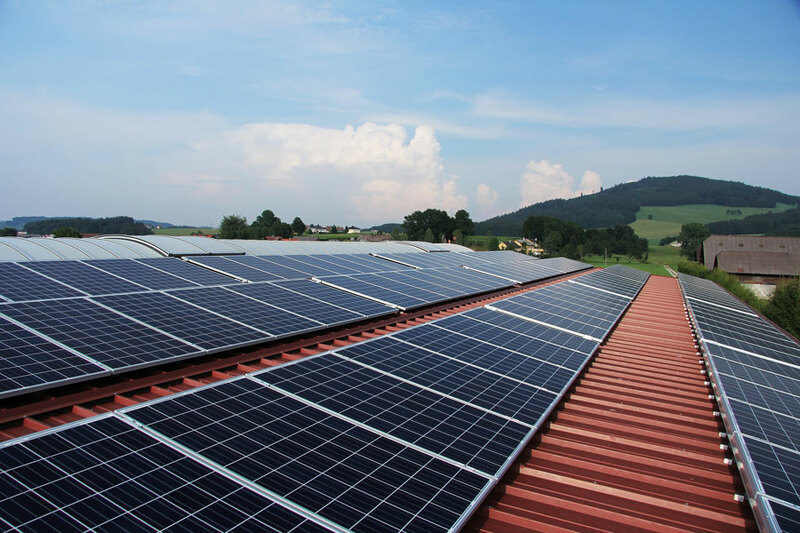 • Utility-sponsored: In general, public utilities have taken the lead in implementing community solar projects, however investor-owned utilities and cooperative utilities can also do so (Coughlin et al). In utility-sponsored programs, customers can contribute either an upfront or ongoing payment to support a specific solar project. The customers then receive a credit on their utility bill that is proportional to their contribution to the energy produced by the solar system. Generally the utility is the owner of the system itself. Community solar programs differ from more common utility-led “green power” programs in that they are for a specific solar installation, rather than a variety of renewable energy resources (Coughlin et al). For ongoing payment schemes, the customer generally signs an agreement to purchase electricity from the solar system at a fixed rate over a set period of time, such as 20 years. This agreement protects the customer from potential rises in electricity cost over time (Coughlin et al). • On-bill Crediting: Residents and businesses individually have to invest in a portion of a shared renewable farm under this model, and they receive a credit for the energy produced by their portion of the investment on their bill. • Special Purpose Entity: Through a special purpose entity, individuals join together to develop a shared energy project under a new business enterprise. They are able to take advantage of tax incentives and bulk pricing through this model, but need the technical savvy and capital to begin the process. This model does not seem to be widely used. • Non-profit Model: In this model, individuals or businesses can act as donors to a nonprofit that owns a shared renewable energy installation, essentially buying in to a shared solar farm by way of donation. • Group Billing: Utilities produce group bills showing all participants’ energy consumption and relevant charges. Generation from a shared system is counted against the group bill. The remaining costs are divided amongst the participants, depending on previously determined rules. • Virtual Net Metering: This program allows residential and commercial groups to share generation from a shared solar system. The owner or property manager determines how much of this shared energy will be delivered to each resident. • Community-solar Rules: In some states, these policies explicitly allow for utility-sponsored and group and individual owned shared solar installations. Other policies that affect community solar include caps on community solar installation size, restrictions to ownership of community solar, joint ownership policies, and tax policies and incentives. Map of Community Solar Policies, created by Kara Clauser with data collected by Greer Ryan. Community solar programs are expanding into new states and utility service areas every year. Besides net metering policies, community solar policies are the fastest developing and changing distributed solar polices at the state level (NC Clean Energy Technology Center 2018). As of 2019, there are 20 states with community solar legislation either enacted or proposed. The map below shows state-wide community solar programs enacted in yellow and state-wide pilot community solar programs in orange. Community choice aggregation refers to a system in which a local government or other representative organization contracts with a solar electric supplier for a pre-specified amount of electricity on behalf of their residents. CCA programs work in partnership with utilities, which continue to own and operate the electrical system and manage the load. CCA programs are similar to the aggregated group purchasing discussed above in that the local governments can still take advantage of the bulk pricing for the solar generated electricity, and individuals benefit from shared systems off of their property, with their share considered against the electricity they use in their homes. However, CCA systems are generally “opt-out” systems, in which individuals within a local area are included in the system unless they actively decide not to be. 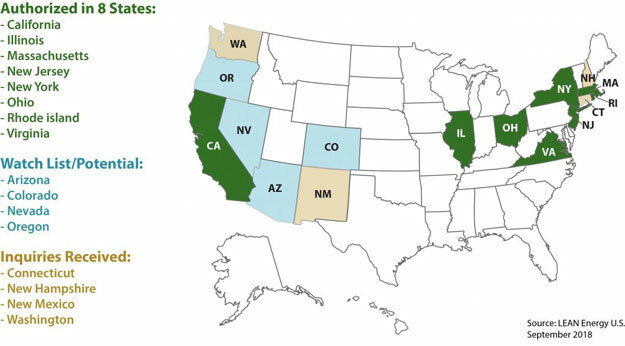 At this point, eight states allow for Community Choice Aggregation: California, Illinois, Massachusetts, New Jersey, New York, Ohio, Rhode Island and Virginia (DOE 2018). Map of Community Choice Aggregation Policies, courtesy of LEAN Energy US. In the eight states that allow for community choice energy, local governments or trade organizations are able to develop a contract with an energy supplier to purchase a specified amount of generated electricity, which either could include or be entirely distributed solar. Under the most common and successful version of the CCA model, this electricity would then be delivered to all residents or customers, unless they choose to opt out of receiving this energy. For example, In Illinois and Ohio, customers are automatically enrolled after a public referendum period. In California consumers are enrolled when their local elected representatives vote to develop or join an existing CCA program. They always have the option to return to normal utility service, however. To date, CCA programs have mostly pursued traditional procurement strategies. They buy wholesale power and entering into power purchase agreements with large-scale remote renewable power plants or, less beneficially, purchase unbundled renewable energy credits from afar to “green up” their supply portfolios on a year-to-year, “rented” basis. In order to achieve more enduring and transformative results, CCAs must prioritize the integration of distributed energy resources, by building new local generation and demand response resources, whether financed by local government bonds, commercial investment/credit, and using community shared solar and targeted efficiency products to open up participation to all customers. This horizontal integration is possible. For example, the most widespread CCA commitments so far come from California. Local Power Inc.’s analyses of CCAs in Marin, Sonoma and San Francisco between 2009 and 2013 indicated that 60 to 80 percent of electricity could be provided by in-county resources at or below utility rates. Sonoma’s Clean Power program and Marin’s Clean Energy program are two model examples of CCA programs already underway. Sonoma’s service includes a mix of geothermal and distributed solar generation. It emphasizes customer-owned resources, whereas Marin’s program focuses on local solar. • Illinois communities have taken part in the state’s “municipal aggregation” program, but not all of them opted to support renewable projects. • Lowell, Mass., began offering its residents 100 percent green power in 2014. • Cleveland, Ohio, offers its residents 100 percent green power; this started in 2013. • Lancaster, Mass., has incorporated local solar into their mix of energy sources.